Some like it hot. But not that hot. What a ruddy bloody shame it was the day that Almost Famous burned to the ground. I think the whole of Manchester felt the pain of Beau and his team, as pictures appeared of firefighters tackling the inferno which would shut down the legendary burger joint. Bloody chip pan. Like a phoenix from the flames, the Almost Famous team were not to be beaten by a few cindered beams. 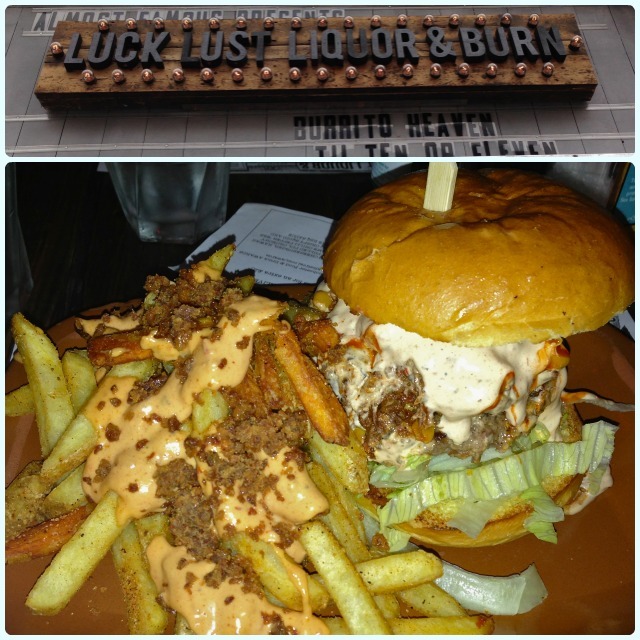 They concentrated on their pop up at Great Northern, their new restaurant in Liverpool, and found a temporary home in their sister restaurant, Luck, Lust, Liquor & Burn. Always one for a witty moniker, the Liquor and Burn menu changed slightly, to include a few new options. 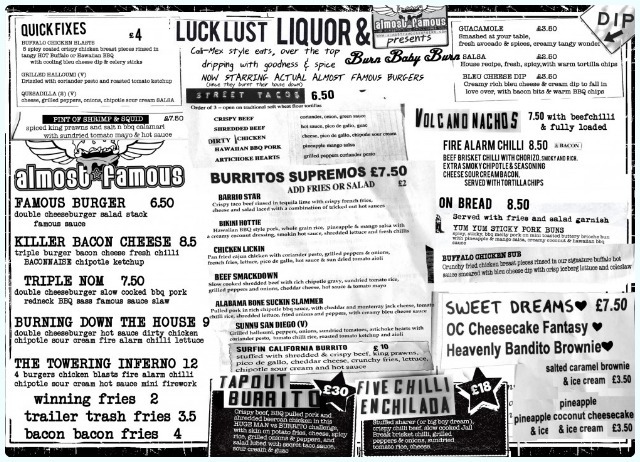 Poking fun at their own misfortune, the menu is now host to the 'burning down the house' and 'towering inferno' burgers, as well as 'fire alarm' chilli. You've got to laugh, right? We arrived about 8pm on a Friday night, when restaurant table real estate is fierce, and manoeuvrability in the northern Quarter is already minimal. They don't take reservations, so we had resigned ourselves to a long wait - we had a plan. Luckily so did they! There was an hour wait, so our names were put onto a list. We were told what time to return, so we nipped for a couple of drinks in Common and Marble first. We both ordered the 'burning down the house' burger with 'bacon bacon' fries. 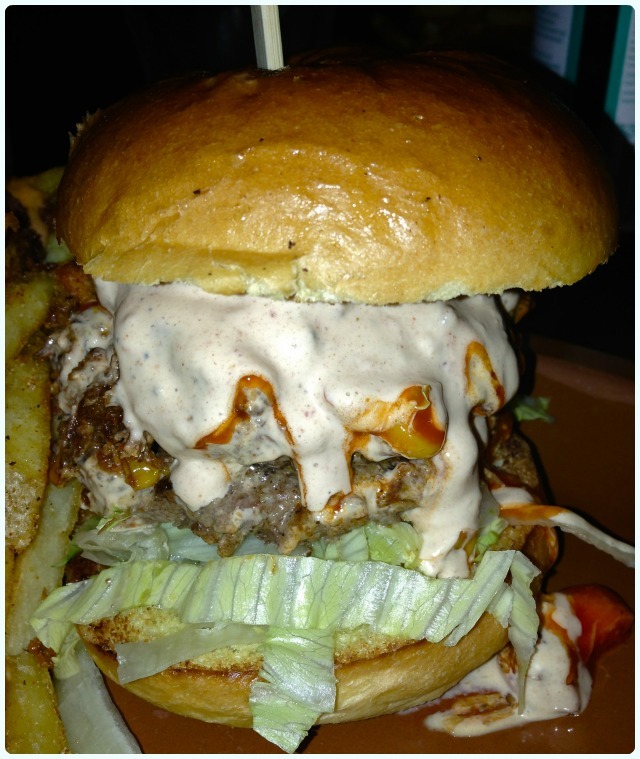 This is a double cheeseburger with hot sauce, dirty chicken, chipotle sour cream, fire alarm chilli and lettuce. 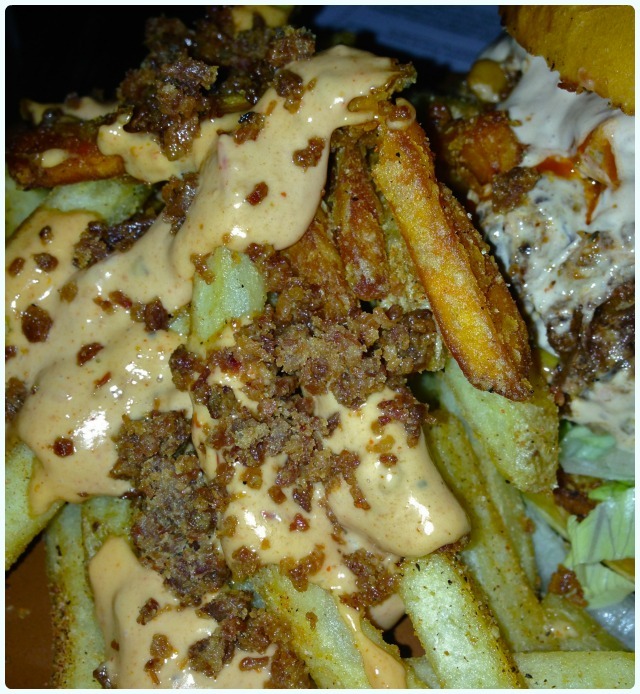 The chips are topped with bacon mayonnaise and crispy bacon bits. Amazing. If you find yourself in need of belly busting, meat based, taste bud tantalising gloppiness, you're in the right place. It was impossible to eat with your hands, so I was forced to deconstruct mine! The perfect antidote to work educed melancholy. Once again, the staff were attentive, and were managing the queuing system efficiently. My only complaint was that we were waiting near the pass. That is tantamount to actual torture. I cannot be held responsible for my actions if this happens again, and there is a very real possibility that I will leg up a waiter, and run off with a burrito like a spritely Jack Russell who hasn't had his tea yet. First review of Luck, Lust, Liquor & Burn.